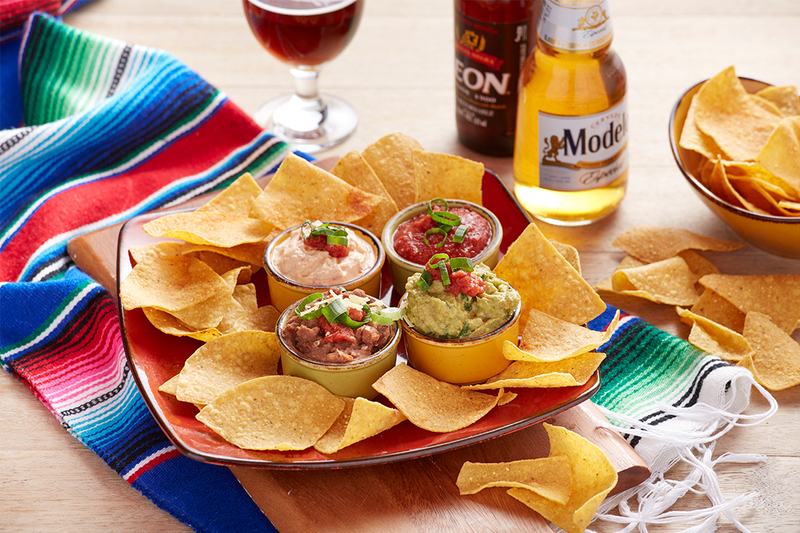 Our Entrées or ‘Entradas’ are a selection of smaller, starter style meals which are Mexican classics. Try the delicious Chilli Con Carne - premium ground beef simmered with tomatoes, frijoles, onions, herbs & spices. It’s then garnished lovingly with cheese and shallots and served with heated corn chips. A moreish blend of melted cheese, tomato, onion & peppers. Served with a stack of crisp, heated corn chips. Mild ranchero sauce. A pleasantly sharp tomato-based sauce made with onions, green chilies and seasonings. Served with a stack of crisp, heated corn chips. 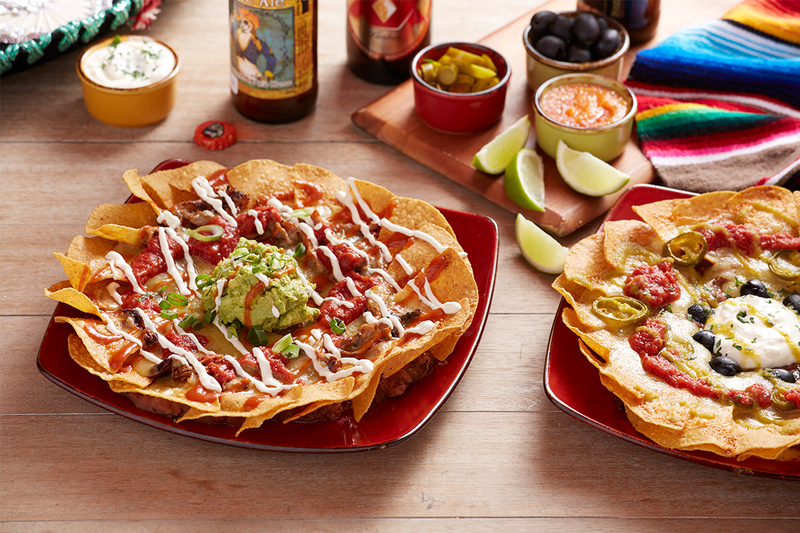 Our popular version of a Mexican staple. Whipped beans, topped with ranchero sauce & cheese. Served with a stack of crisp, heated corn chips. 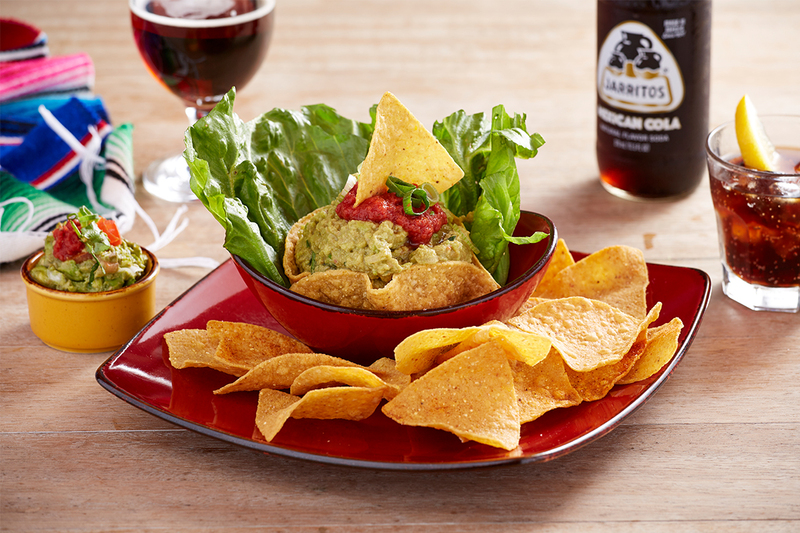 Smashed & spiced avocado served in an edible corn tortilla basket. Served with a stack of crisp, heated corn chips. 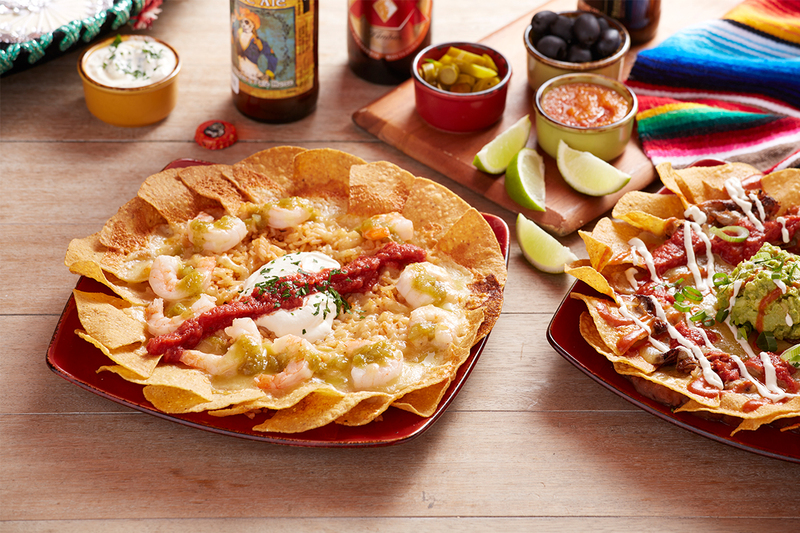 A taster of Ranchero, Frijoles & Queso Fundido. Arriba! Served with a stack of crisp, heated corn chips. Ranchero, Frijoles, Queso Fundido & Guacamole. Served with a stack of crisp, heated corn chips. Our house recipe of a base of toasted corn chips on a bed of frijoles, topped with oven-grilled cheese & delicious ranchero sauce. 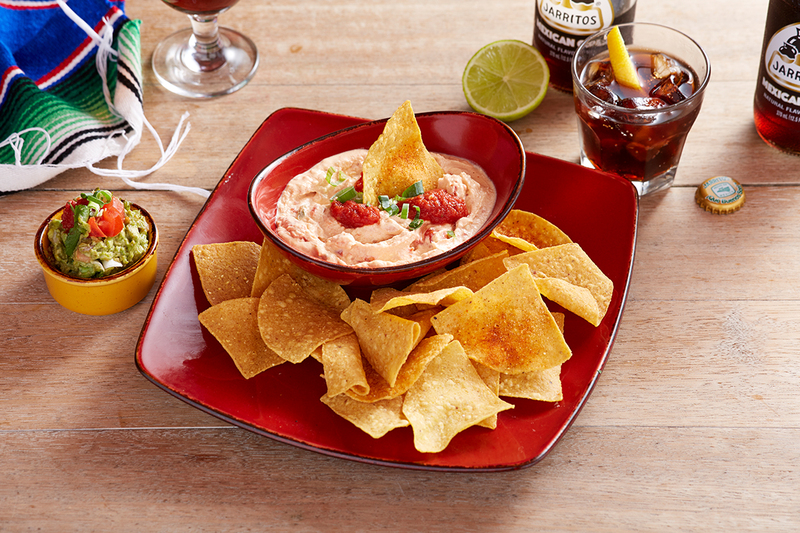 Garnished with our own smokey chipotle sauce, a drizzle of sour cream and house made guacamole. Choose from Beef or Chicken or Pulled Pork. Our house recipe of a base of toasted corn chips on a bed of frijoles, topped with oven-grilled cheese & delicious ranchero sauce. Choose from Beef or Chicken or Pulled Pork. Our house recipe of a base of toasted corn chips on a bed of frijoles, topped with oven-grilled cheese & delicious ranchero sauce. With Jalapeños, Sour Cream, Olives. Our house recipe of a base of toasted corn chips on a bed of Spanish rice, topped with oven grilled cheese & garlic prawns, tomatillo sauce, sour cream and ranchero sauce. 2 rolled deep fried corn tortillas stuffed with beef, garnished with ranchero sauce & cheese on a bed of lettuce. A Montezuma’s favourite. Ground beef simmered with tomatoes, frijoles, onions, herbs & spices. Garnished with cheese & shallots. Accompanied by heated corn chips. Quesadillas Montezuma’s style: an open-faced wheat tortilla with oven-baked spicy Mexican chorizo and melted cheese. Garnished with lettuce, more cheese and ranchero sauce. A warm corn tortilla heaped with frijoles (whipped beans), lettuce, onions, cheese & salsa. A warm corn tortilla heaped with a piquant blend of frijoles, almonds and sultanas. A warm corn tortilla heaped with frijoles, lettuce, onions, cheese, salsa and your choice of beef or chicken. Filled with Montezuma's whipped beans and topped with onions, lettuce, cheese & ranchero sauce. Encased in a crunchy corn or soft wheat tortilla. Filled with a piquant blend of frijoles, almonds and sultanas and topped with onions, lettuce, cheese & ranchero sauce. Encased in a crunchy corn or soft wheat tortilla. Filled with shredded beef prepared the traditional Montezuma's way and topped with onions, lettuce, cheese & ranchero sauce. Encased in a crunchy corn or soft wheat tortilla. Filled with Montezuma’s style Mexican chorizo and topped with onions, lettuce, cheese & ranchero sauce. Encased in a crunchy corn or soft wheat tortilla. Filled with oven-roasted chicken and topped with onions, lettuce, cheese & ranchero sauce. Encased in a crunchy corn or soft wheat tortilla. With chipotle sauce, apple slaw, pineapple & sour cream. Slow cooked house made pork surrounded by a crunchy corn tortilla topped with apple slaw, pineapple, chipotle sauce and sour cream. Battered whiting served with salsa bandera and zesty Mexican sauce. Note: All meals are prepared individually with Gluten Free ingredients. However we cannot guarantee completely against cross contamination in our kitchens.